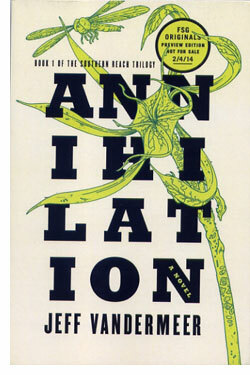 If we left off with Jeff VanderMeer's 'Wonderbook,' it's only appropriate that we return with 'Annhiliation,' (Farrar, Straus, Giroux ; February 2014 ; $13) billed as "Book 1 of the Southern Reach Trilogy." "It came to me in a dream," VanderMeer told me, and for that, we should be thankful that he has these dreams and we do not. That he calls the sleeping experience a dream and not a nightmare is indicative of his threshold for strange and not your ability to partake of terror. 'Annihilation' unfolds as four women; a psychologist, a surveyor, an anthropologist and a biologist enter Area X, the twelfth expedition to a portion of the world now irrevocably changed into something very strange. Previous groups met a variety of fates, most of them unfortunate. Of course what we find when we venture anywhere unknown is not a place, but ourselves. Rest assured that those in VanderMeer's Gang of Four have some serious issues with one another, with humanity and with themselves. Most importantly, readers can rest assured that VanderMeer's crystalline prose will take them into an immaculately imagined landscape that expertly combines the familiar and the unfamiliar with the effect that upon reading, readers will most assuredly not be resting much. Working with the trope of exploring the unknown, experts iconic in areas human endeavor and an unsettling dose of the fantastic, 'Annihilation' is likely to lodge itself in your mind and your dreams. If you want to, you can call them dreams, though that might not be your inclination, and if it is you might want to worry. 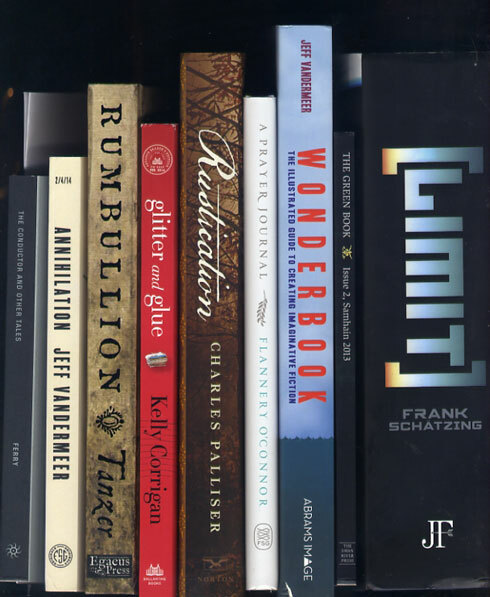 Of course if strange is your destination, then Egaeus Press is a reliable transport and Mollie Tanzer's 'Rumbullion and Other Liminal Libations' (Egaeus Press ; October 28, 2013 ; £30) should be your drink of choice. Let's start with the book itself as a book, because, well, it's utterly gorgeous. Assuming you like weird and antique. Egaeus understands that reading is an experience and enhancing the medium matters. No dust jacket, creepy-as-all-get-out endpapers, lots of weird little illustrations and a book design that makes you feel like you're holding a volume of forbidden spells set the atmosphere quite well before any of the words has a chance to enter your eyes. And once that starts, you'll find a work that leaves unique behind at the trailhead and strikes out for territories unknown. Much of the book is the title story, a novella in which the events surrounding a dinner with the Count of St. Germain are pixilated by a bevy of unreliable narrators. Often hilarious, then weird, then both, "Rumbullion" manages the neat trick of engendering both laughter and the awe of mystery. The rest of the stories in the book cover similar territory in briefer form, distilling different themes with precision and offering a rather stupendous variety of setting and style. 'Rumbullion' also includes recipes for drinks at the end of each story. Given the nature of the stories themselves, and the fact that the drinks all include a variety of hard liquor (or at least what this naïf considers such), this may be the first book I've reviewed that comes with a "Don't drink and drive? Don't drink and drive? How am I going to get anywhere?" warning sticker. Should you require a return to a world more closely resembling the one in which you currently reside, you can (after a proper waiting period) seek out Kelly Corrigan's 'Glitter and Glue' (Ballantine Books / Random House ; February 11, 2014 ; $24.00), in which plainly-spoken words transcend life and take us into the human soul. Corrigan, like many, finished college and wanted to get out of Dodge, to get away from the uneasy security of family life. She found herself out of money and in Australia, where she took up work as a nanny for two children who had recently lost their mother. 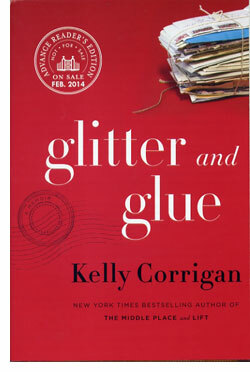 With crisp, prose, Corrigan shows us what happens to her as what she takes to be a simple job unpacks her far more complicated feelings about her own family. Having journeyed far from home, she comes to rest only to begin a journey within. Corrigan's writing is so seductive and engaging, you'll find the book unpacks in your mind with no effort. Reading this book is a wonderful place to be still in your heart and travel in your mind, no matter where your heart and mind set out from. Even readers who have recently left Jeff VanderMeer's Area X are going to find Kelly Corrigan's 'Glitter and Glue' a lovely, intense and powerful destination. You'll feel like you have a great new friend, whose fascinating stories somehow become your story as well. If reading is a place, and I would contend that to be the case, then I would ask how many other readers remember their stay in Charles Palliser's 'The Quincunx' as if it were just yesterday? 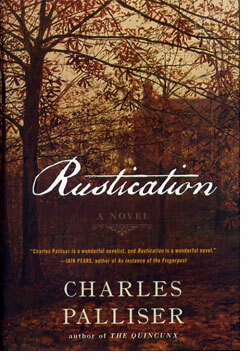 Palliser knows well how to use words to cast a spell, and he's in top form with 'Rustication,' (W. W. Norton and Company ; November 4, 2013 ; $25.95). The title refers to what happens to you when you're sent to the countryside to recover from being your own bad self. It was the nice thing to say back in the 1800's when most of the story is set. But Palliser is up to quite a bit more than a rustic idyll here. We find out some very bad things from the get-go, as "CP" discovers the "journals" that comprise the bulk of the book. The journalist is one Richard Shenstone, an opium-addicted teenager who is punted from school and sent back to a decaying mansion at the edge of England, economic stablity and eventually, sanity itself. I trust that the slim volume hiding between the Tome and the HOWTO has not escaped the notice of my eagle-eyed readers. 'The Green Book, Issue 2, Samhain 2013' (Swan River Press; October 2013 ; €10) is yet another fine example of why buying everything the Swan River Press has to offer is a pretty damn good idea. 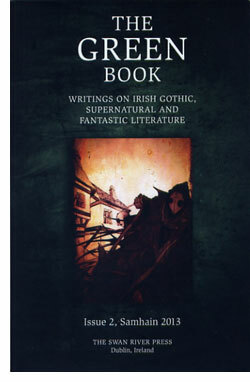 In this case, a slim little trade paperbackish sort of book is filled with exactly what is described in the subtitle: "Writings on Irish Gothic, Supernatural and Fantastic Literature." You might think, and you'd be correct, that this is a rather obscure corner of the literary world upon which to focus, but as editor Brian J. Showers points out in an enthusiastic and classy introduction, Ireland can lay claim to Bram Stoker, and he's no small player on the stage of the fantastic. But don't expect to find re-hashes of vampire fiction critiques here. Do expect to find thoughtful, though-provoking works about authors you've likely never heard of but will be equally likely to want to read after reading about them. Thusly, in this issue find an article on Mervyn Wall by Richard Dalby; then starrt looking for work by both authors. Albert Power is in the midst of along work, started in Volume 1, "Towards an Irish Gothic." It's quite nice and very smart of Showers to use such a work to tie together his volumes and provide a bigger picture as to what he's all about. Ray Bradbury's Irish-ish work and time in Ireland is covered by Steve Gronert Ellerhof, while Nicola Gordon Bowe covers "Lord Dunsany, 1878-1957: Portrait of a Collector." the 107 page book is rounded out with reviews of books you've never heard of (I've never heard of some of these, and I do get around). You may find these detrimental to your fiscal stability but agreeable to your mental well-being. All of this is written with a light touch. Showers is not trying to change the world but a shine a light on a part of it with which he and his writing friends appear to be quite familiar. There aren't that many copies of this Green Book out there, but those that remain should find a home quite easily, where they will make some readers feel quite at home in a world that does less and less to do so. That could be said of any of the volumes here. I simply trust that readers understand that there are more tacks for me to go through and write about, and that I shall do so in the fullness of time. It's a balancing act that is less like a tightrope and more like a seesaw. Focus for the interview, read for the rainbow. Yes, back in the day, I loved staying home from my (then) job (which actually paid cashable checks) of being a networkish sort of fellow to keep a sorta-sick child company and watch the PBS kids' lineup. Sesame Street sans CGI, the epitome-of-awesome Mr. Rogers' Neighborhood, and Reading Rainbow with Star Trek refugee LeVar Burton made for the best TV could offer, and the old stuff still stands up. Now I try to make way through stacks of books and report to my readers on the embarrassment of riches that is comes in over the transom. We truly live in amazing times. For all the crap culture that tries to cover us up, there are hundreds of books that are well Worth Your Valuable Reading Time — and to suit a variety of tastes. You're probably wondering about that brick, Frank Schätzing's '[Limit]' (Jo Fletcher Books / Quercus ; November 5, 2013 ; $29.95) Coming in at 1,238 pages, with a seven-page list of characters, I'm rather shocked it didn't end up getting split into a "trilogy." 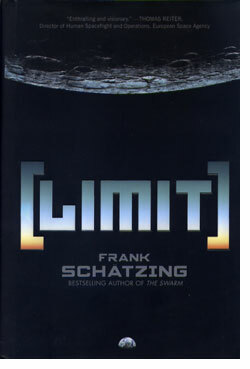 Schätzing is a best seller in Germany, and this 2009 title is a big-screen follow-up to his previous novel, 'The Swarm,' in which an alien intelligence turned the oceans against us. This time around, we're in a bit more of a hard-science, near future mode. Hyper-rich magnate Julian Orley has built a space elevator and opened up a lunar hotel, already in danger. Cyber-detective Owen Jericho is tasked with finding Chinese dissident Chen "Yoyo" Yunyun. The oil industry is unhappy that Orley is in the process of making them irrelevant. Stuff happens — a lot of stuff. If you're ready and willing to commit to what amounts to a trilogy in one volume, and have scaled the heights of Peter Hamilton's tomes, this is the book for you. The translated prose lurches now and again, but the scaffolding is solid and the world building beyond thorough. I give Schätzing bonus points, many of them, as an author, who offers a very different vision of the future than we're used to here in the States. No apocalypse, and a future more like the present, one that acknowledges that change happens a lot slower than genre novelists like to assert. Here's one of those get-lost-in-me books that's actually big enough to do the job, and does so rather crisply. And I just like the fact that it's a big ol' book that you have to read. Saddle up, buckle down, turn the pages. All too easy, old-fashioned, tomorrow-now fun. 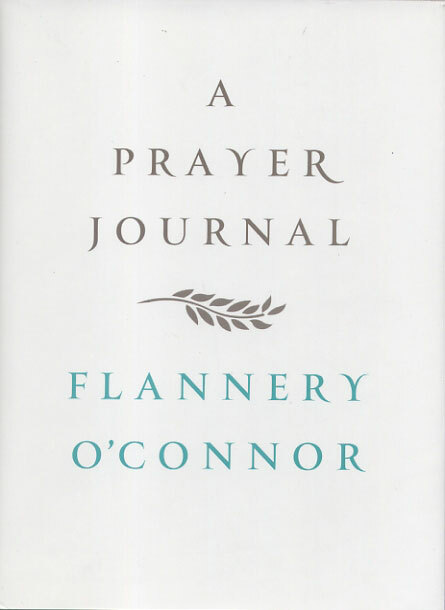 On the other side of the spectrum you'll find 'A Prayer Journal' by Flannery O'Connor (Farrar, Straus, Giroux ; November 12, 2013 ; $18.00). Recently discovered in a Sterling notebook, the new volume, edited and with an introduction by W. A. Sessions, records O'Connor's hopes and fears as she undertook to become a writer. Sessions has corrected O'Connor's "innocent" spelling and left her voice intact. There are 39 pages of typescript, and a facsimile of the notebook itself. 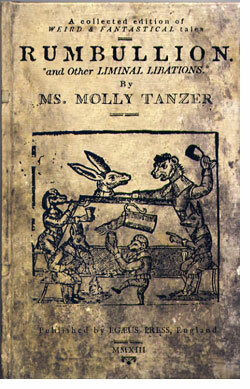 Present on the page is the author herself, a mind full of clarity, doubt and power. The notebook was written while she was at the University of Iowa, working on the stories that would become 'Wise Blood.' In here, you'll find the concise power of fragility, the intensity of doubt and the hard questions with which she would confront herself throughout her life. For all that this is but a fraction of the length of an ordinary hardcover, it is worth a shelf full of many books. O'Connor here show readers the beauty behind the writing that still grips us and will continue to do so. This is essential, a gift to readers and writers. Readers looking for a little book to mess with their minds can take a ride with Jean Ferry and 'The Conductor' (Wakefield Press ; November 30, 2013 ; $13.95. Gorgeously and poetically translated by Edward Gauvin, 'The Conductor,' collects all the surrealist "pataphysical" fiction by a man who spent most of his time writing screenplays for the like of Luis Bunuel and Louis Malle, including four new stories not included in the original 100-copies edition published in 1925. Add to that many intricate, beautiful black-and-white collages by Claude Ballaré and you have the reading version of early surrealist cinema. The stories are very short, sometimes only a single paragraph, and the careful translations of Gauvin shines, preserving the creepy, weird, disorienting feeling of reading a journal written by someone who lives one step to the right and left of the reality the rest of us inhabit. 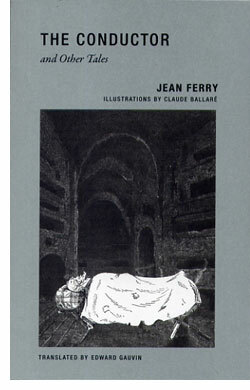 Ferry's stories, parables, prose poems — any one of those descriptions might fit any one of the works here at one time or another — make a ruthless sort of sense that cuts right through what the rest of us see and experience. Yet he conveys his vision with an economic precision that makes the absurd, just for a moment, almost pedestrian. Readers of weird fiction and literary fiction are gong to find a lot here to like. It's a very surreal and odd experience, outside of what you think you expect. Before you recover from your trip with 'The Conductor' and before you try to set pen to paper yourself, you can avail yourself or a writer's guide like no other and like no other ever to be published, ever. I feel absurdly safe making this prediction. 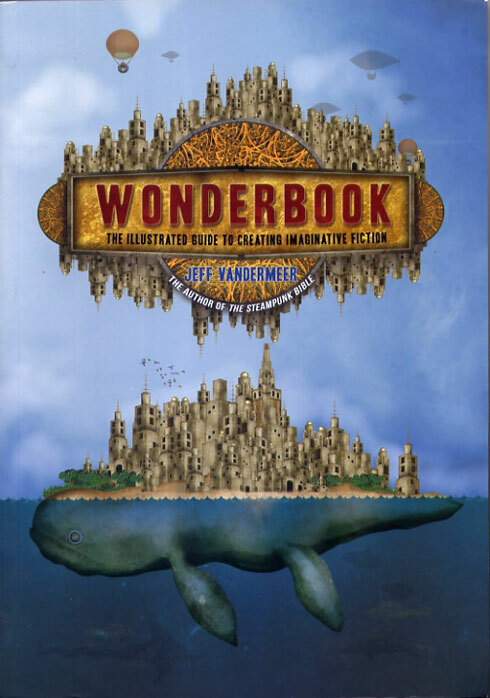 This would be Jeff VanderMeer's 'Wonderbook: The Illustrated Guide to Creating Imaginative Fiction' (Abrams Image ; October 16, 2013 ; dirt cheap at $24.95). How-to-write books may in general be easily if uninterestingly summarized, "Write." VanderMeer sidesteps this by offering would-be writers the average how-to book after three or four sugar cubes of first-rate lysergic acid diethylamide. It's authentically mind-bogglingly illustrated by Jeremy Zerfoss and a LOT of others, with design by Zerfoss, VanderMeer and John Coulthart that will without doubt, crack even the most solid of minds. And while the general thrust is a museum's worth of very practical advice for writers, I can't imagine anyone not benefiting this ultimate treatise to creativity itself. If every nation in the world made this a high-school level textbook, we'd all be living in a yellow submarine. I'm going to take a brief break here, and come back to the rest of the books on the shelf on the morrow, with the idea that I might be able to get this posted in a slightly timely manner. Moreover, I trust that readers will already have taken the point that there is more to this world than is accounted for by your game console, television set or your internets, upon which you read this article. Here's to a few good books, knots for a noose around bottleneck of Brand Name Reality.